← Sept. 13: Too Smart to Be Conned? Think Again! No matter what kind of science you write about, you’ll find rare and riveting items in the vast, varied holdings of the New York Academy of Medicine library, with 550,000 volumes including 32,000 rare books. Not only is it one of the world’s leading collections of medical history, NYAM’s library is a powerhouse in other sciences, too. You’ll learn how to take advantage of their appointment-only research library, where the reference staff leads writers to specific resources they may not otherwise know about. Join us at this truly remarkable collection on the history of medicine and science. The magnificent 1925 building features carved details of animals and medicinal plants. 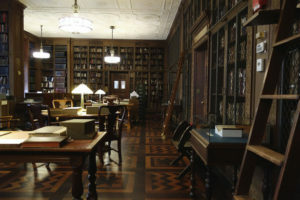 Our visit will take place in the historic 1933 Doctors Barry & Bobbi Coller Rare Book Reading Room, the gem of the building, where custom light fixtures were designed with early printer’s devices. During our private, carefully-planned tour, librarians there will show us fascinating highlights of the collections, discuss them, and answer our questions. SWINY will refund admission fees provided we are notified by noon on Wednesday, October 12. Choose last car if Northbound; first car if Southbound. Walk 1 block east to Fifth Avenue. Turn Right. 6 to East 103 Street. Walk west 3 short blocks.